When it comes to wine I’ll admit, I don’t know too much compared to my experiences with spirits and beer. I’ve covered various tastings within the site and tried my fair share of wines over the years, but it’s rare I get the chance to try a selection of the same brand in one go. With this, I’ve decided to feature a brand I put as part of my ‘Christmas Selection’ within the festive issue of VIVA Lifestyle magazine. Welcome to the Chilean delights of Frontera. 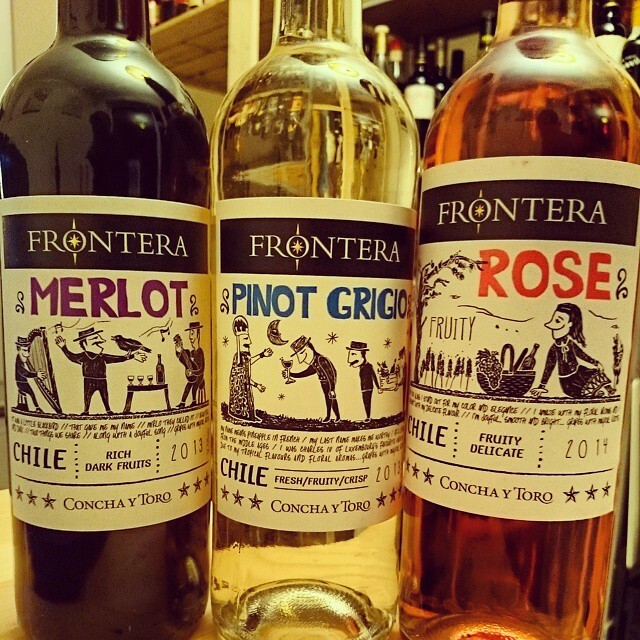 With vineyards found in earth’s southernmost frontier where the central valley is located within a fertile basin, Frontera are seen as a new-world wine, a category of wines produced outside the traditional wine-growing areas of Europe and the Middle East. 2014 saw Chile’s biggest wine brand re-launched and focused on the new packaging and labels. Going back to the roots of ‘Lira Popular’, a traditional Chilean way of visual storytelling, each expression of Frontera now tells its influence on the grapes used, flavours gained and experiences created. Soft green fruits on the nose, apple and pear dominating. Crisp with fresh notes of the green apples coming through on the palate. Small bursts of floral near the lingering, light and slightly dry finish. A Cabernet Sauvignon Blush. Light aromatic nose of strawberries and sweet cherries. Rich sweetness on the palate, smooth with strawberry dominating. Creamy with a slightly dry finish. Deep velvet aromas of stalked cherry and oak. Smooth on the palate with dry cracked black pepper, aromatic cherry and raspberries. Creates a dry lingering finish. A great trio, and as you can imagine, all serve well either on its own or with food. The Merlot is perfect for pasta, cheese, meat and chicken, whilst the Pinot Grigio is great for fresh salads. The Rose is seen as your second wine of the meal, striking up a combination with sweet treats and seafood. For a no hassle approach to your wine selection, the Frontera range should be a name to look out for no matter what time of the year it is. Give them a go, they’re available nationwide in your local supermarket.